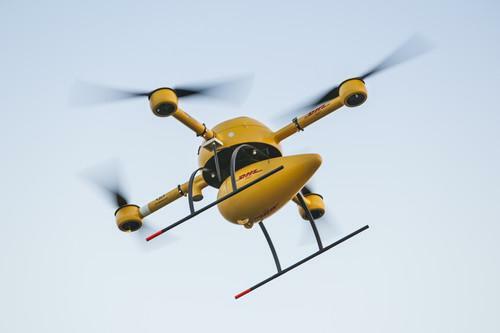 Described as a research project, the flight by the "DHL parcelcopter" is the first time in Europe that a flight by an unmanned aircraft will be operated outside a pilot's field of vision in a real-life mission, the postal and logistics services group said. A restricted flight area exclusively for the project has been agreed on after consultations with German federal and local officials. The flights for Juist will take off from the harbor in Norddeich. Amazon.com and Google have said that they plan to use drones for the delivery of goods, but the U.S. Federal Aviation Administration has as yet to frame rules for the operation of commercial unmanned aircraft systems (UAS). The use of very small model aircraft for recreational purposes is allowed under certain conditions, including the requirement that it stays visible to the hobbyist at all times during flight. DHL Parcel said it has moved to the next phase of the project it launched with a maiden flight in December 2013. In the first test flights, medications were transported from one bank of the Rhine river in Bonn to the other. There are no specific plans at present to use the drones for normal parcel deliveries, DHL said. "To the extent that it is technically feasible and economically sensible, the use of parcelcopters to deliver urgently needed goods to thinly populated or remote areas or in emergencies is an interesting option for the future," it added. Civil drones are being used in some countries in Europe for monitoring infrastructure and in disaster relief and for spraying crops, but there are only national level regulations rather than a Europe-wide framework. The European Commission said in April it would start working on tough standards to regulate the operation of civil drones, covering issues such as safety as well as privacy and data protection, ahead of new applications of drones, including possibly the delivery of "books from your favourite online retailer." The about 12 kilometers flight to Juist at certain times of the day will be completely automated but the parcelcopter will be constantly monitored during the flight by a mobile ground station in Norddeich "so that manual action can be immediately taken in real time if a malfunction or emergency occurs." The parcelcopter can travel up to 18 meters per second at a height of 50 meters depending on wind speed. It has a total weight of below 5 kilograms and can carry a load of up to 1.2 kg. The quadrocopter is powered by four identical fixed pitch propellers and can be steered in any direction by adjusting the speed of the individual power units, DHL said. While a video of the Amazon drone suggested that it would deliver goods at people's doorsteps, the DHL parcelcopter will land at a field on the island that is reserved for it. From there, a regular DHL courier will deliver the goods. DHL has partnered with two research and development organizations- the Institute of Flight System Dynamics at RWTH Aachen University and Microdrones. The FAA is required by U.S. Congress to frame a "safe integration" plan for the commercial use of UAS by Sept. 30, 2015. It said in February that it expected to publish a proposed rule for small UAS of under about 55 pounds this year. "That proposed rule will likely include provisions for commercial operations," it said. Seven aerial photo and video production companies have asked for regulatory exemptions to use UAS for the film and television industry. Google and Amazon are already testing the use of drones for deliveries. In its application to the FAA in July for testing drone-based delivery services, Amazon said it was limited to testing its commercial service indoors or abroad because of the agency's regulations.